That little part of me that everyone likes to call weird pays off again. I guess. 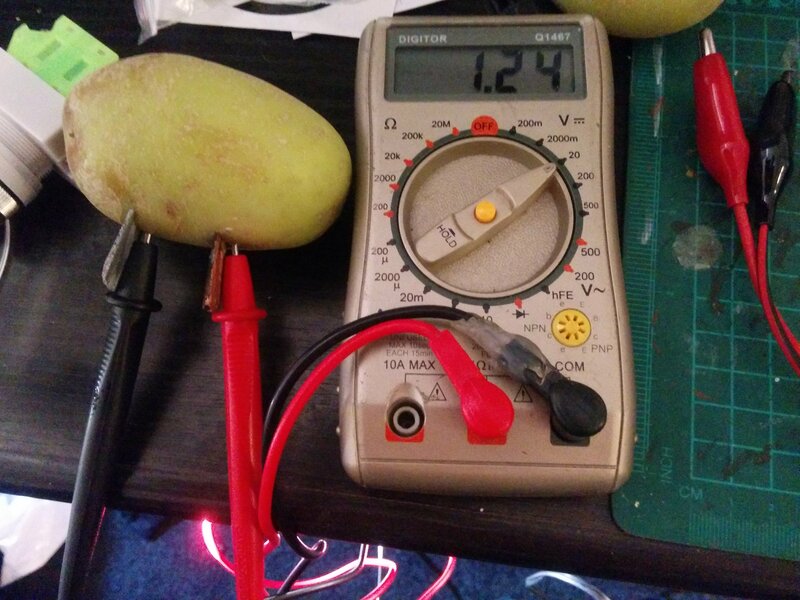 You can charge a potato! 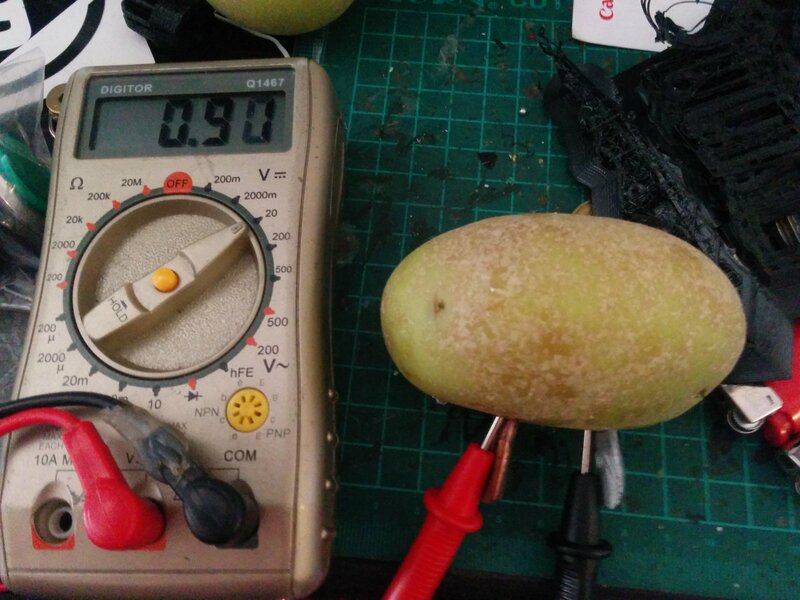 As you can see in the above pic here, we only really got 0.9volts out of this humble spud. This is pretty much the same as what we’ve based our calculations on thus far and ended up with some big numbers (in the region of needing a potato farm or chip shop) to power the most basic device. As is often the case, I had a eureka moment mid ramble the other day. 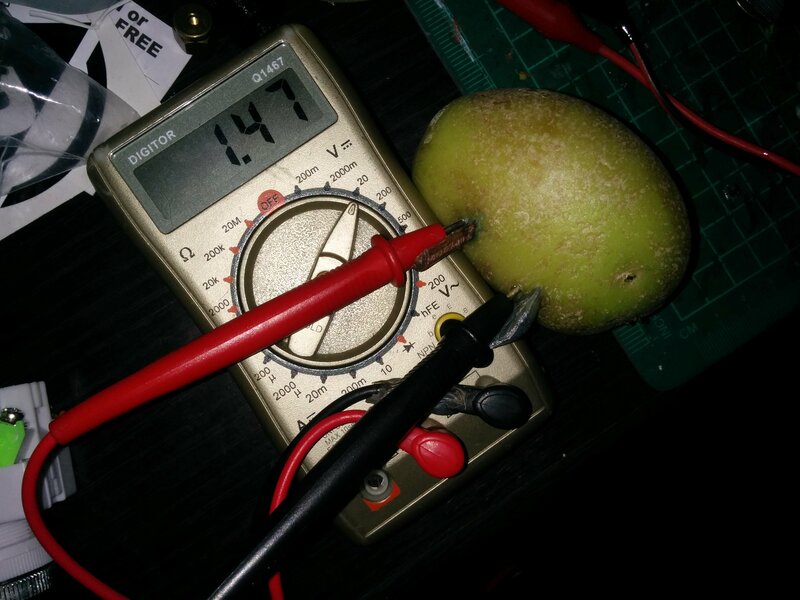 I can only imagine how much weirder it would have been on the outside of my head when I stopped mid sentence and said, “How do I know when my potato is charged?” For those not living in my head, when you build a car battery, the very last thing you do is charge it before putting it in a car. We’d been neglecting the possibility of charging the potato to a higher capacity. A quick and cautious charging (basically cramming 6 volts into it at a few milliamperes) and you can see from the above pic, we got a solid improvement. So I went a little gun-ho and bumped that up to 20 volts and 20ma. I got the charge up to 1.5volts, but it wasn’t very stable and began falling right away. By the time I took the photo it had dropped to 1.47volts as you can see. But the proof of concept is there, which opens up a bunch of other possibilities. So while this is closer to gravel than graphene as far as battery materials is concerned, what I can say for sure is that innovation lives somewhere in the same neighbourhood as weirdness. This was just a quick charge, so I’m going to test further to see what putting it on charge for a few hours can achieve. Hopefully it will charge properly (in accordance with the international vegetable charging standards) and hold some significant power. Moral of the story: Just because you think you know what will happen or something is pointless, doesn’t hurt to check.